The city of New York is home to a hidden trove of murals, prominent among which are those of the Carlyle Hotel, a particularly beautiful art deco landmark. Wander into the Café Carlyle, the cabaret that has been home to Bobby Short, Eartha Kitt, and Woody Allen, and admire the 1950’s pastoral airy cirque-themed walls by Marcel Vertes. For a quieter cocktail, try Bemelmans Bar with its whimsical scenes of Central Park, complete with an ice-skating elephant, roller-skating rabbit, and elegant giraffes, all with delightful hats or bow ties. Along one wall are twelve little girls in two straight lines: the eponymous muralist, who accepted accommodation in lieu of payment, was none other than the author/illustrator of the Madeline books. 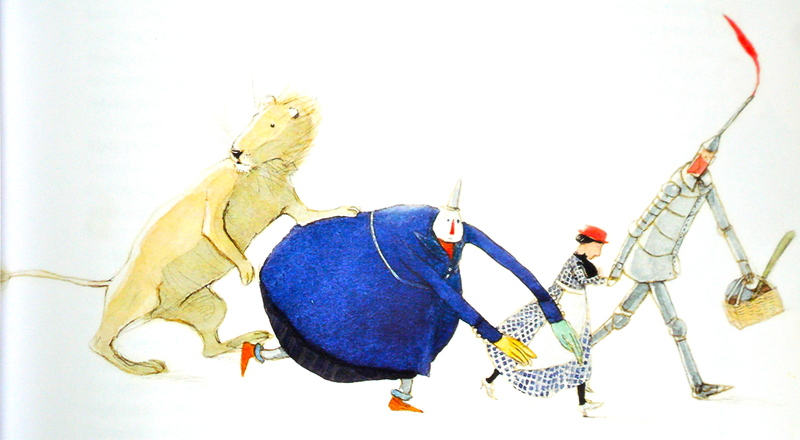 Ludwig Bemelmans claimed, in his acceptance speech for the Caldecott Medal (awarded for Madeline’s Rescue), “I have repeatedly said two things that no one takes seriously, and they are that I am not a writer but a painter, and secondly that I have no imagination.” No false humility here. At least for the former, he was right. Witness the bizarre and awkward meter of his rhyming couplet – “And soon after Dr. Cohn/ came, he rushed out to the phone.” Nonetheless, he succeeded in creating one of the most lasting characters in children’s literature, and a story as fresh today as when it first appeared in 1939. What is it about Madeline? Start with the opening. “In an old house in Paris/ that was covered with vines/ lived twelve little girls in two straight lines./…..the smallest one was Madeline.” Madeline emerges from the anonymous dozen in a defiant stance, posed like a statue on a dressmaker’s chair (the dressmaker on her knees) – clearly an individual. She distinguishes herself by being spirited and mischievous and fearless and independent, one in a rich canon of plucky heroines (going back to Jo in Little Women and Anne in Anne of Green Gables). Yet there is the reassuring predictability that attaches to being pa rt of an identically dressed group, the comfort of daily identical routines, the safety provided by the watchful, albeit somewhat inept, care of Miss Clavel at a Paris boarding school, and the love conferred long-distance by a generous Papa. But it is really the illustrations, deceptively simple watercolor and ink, that make the story sing. There is an energy, created by a diagonal upward slant, that makes for an exultant dynamism. Admire the hospital nun with a white winged cornette, surely the inspiration for the Sydney Opera House, who looks like she is about to levitate. Who could give greater sense of urgency to Miss Clavel as she flies, almost horizontal, to her charges in the night? There is a spirited joie de vivre that characterizes Bemelmans’ art, whether it be the iconic Parisian scenes that form the backdrop of the Madeline story or the humorous covers for the New Yorker or Town & Country. One has the sense of a life lived quickly and fully without slavery to detail. That Bemelmans once miscounted the dozen in his paintings or was not consistent with Madeline’s hair (which is variously blond, curly red, and black) adds to the charm. Bemelmans wrote six Madeline books, of which Madeline and Madeline’s Rescue are the stars. There are others created by his grandson, but these do not compare with the originals.